Piazza Firenze, corner of Via dei Prefetti. 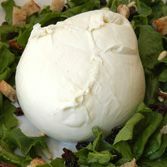 Great fusion place, with every twist on mozzarella as the star player. They’ll mix the melt-in-your-mouth bufala any way you wish. Vegetarians rely on Obikà for its take-out salads. Lovely sandwich combinations made in front of you. If healthy and organic is your preference, check it out. Or you can also just grab a coffee. Open daily 10 a.m.-midnight. Saturday and Sunday brunch.